If I’m honest, I don’t think that I’ve had an original idea in my life, and why change the habits of a lifetime now when I can nick the brilliant ideas of those I work with. The latest idea I’m stealing is “cheat sheets” for tests. My Year 11’s were due a test so for homework I gave them a piece of A5 card (coloured – even in the eyes of the most cynical 16 year old, coloured card is “special”) telling them that they had a test next lesson. For their homework they could put anything they wanted onto their “cheat sheet” and they would be able to use it in the test. It focused their revision for the test and they produced some good notes that helped them in the test and they can keep for the future. 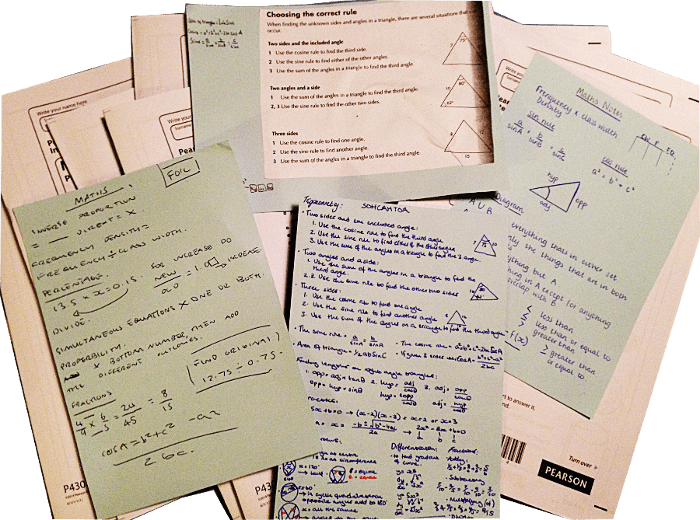 A great way to get good quality, pupil generated notes. I wish I could claim the idea as my own, but I can’t. But I (and my pupils) are very grateful to my colleague from whom I pinched the idea. Really like this idea actually. It makes pupils sit down and really work out for themselves what the key points of each topic are. How does your department deal with the ‘tainted’ data from an assessment of learning standpoint? I think you have to decide on the purpose of the test: if the aim of the test is to obtain a formal measure of what they know and “where they’re at” then we wouldn’t allow cheat sheets to be used. However, if the aim of the test is for pupils to revise, consolidate skills learnt and practice working under test conditions then I think using a cheat sheet is valid, if for no other reason than it will reward hard work and its very obvious to students that hard work before a test pays off.